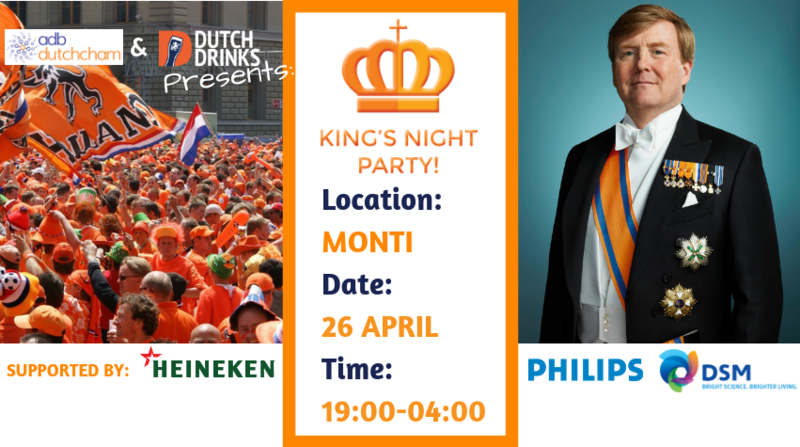 Dutch Drinks Singapore and ADB-DutchCham join forces to show Singapore how we celebrate our King’s birthday in a majestic way. This year we will ‘colour’ the Marina Bay in orange! Enjoy the night view of the city’s skyline at the rooftop terrace of MONTI with your friends. At 22:30 we will move indoors to dance on the songs of Mathilda D’Silva and her six-members’ band. 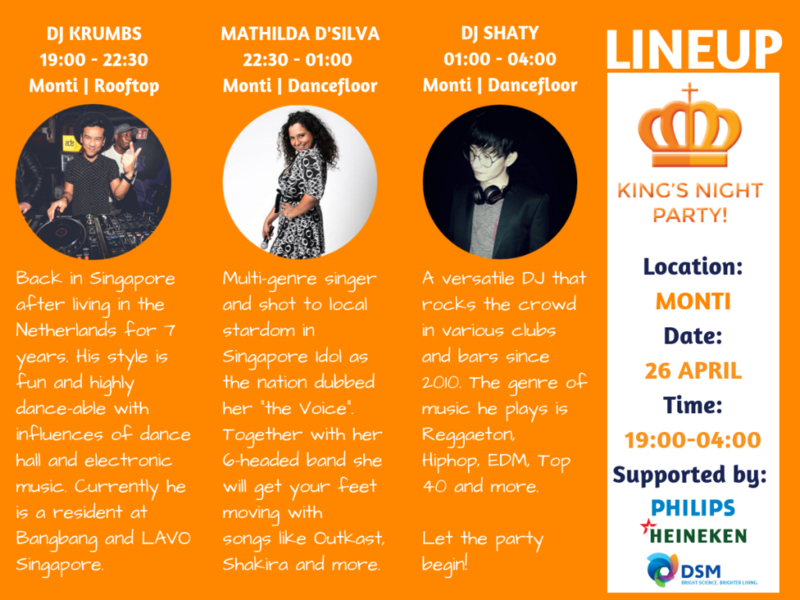 Have you already registered for King’s Night? If not, you (members and non-members) can still do this below to get two free Heineken beers if you are also one of the first 300 that show up at Monti between 7:00 – and 8:30 pm. Make sure you bring your ticket with the QR code, which you can find in the e-mail confirmation, on mobile or printed. The two free Heineken beers can be collected before 10:30 pm with the two tokens that you receive. Buckets Heineken for S$ 50 nett, bottles of wine for S$ 60 nett and cocktails & spirits for S$ 10 nett. Do you arrive straight from work and are hungry? No worries! We serve fries, pizza’s and chicken wings. We thank our sponsors for supporting King’s Night. Like to join the event, all-night long drinks promotions and free Heineken? Register now. Members can register when they login and sign up for a max. of 5 people. If you have problems to login, please contact us. Are you interested to become member of ADB-DutchCham?